$14,100.00 (1990) . . . 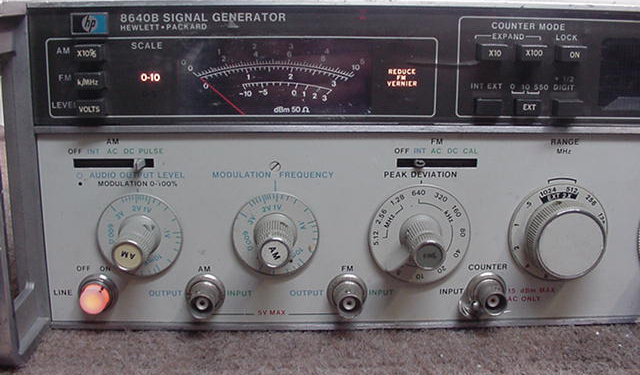 In case you don't know these were top of the line premium priced signal generators. 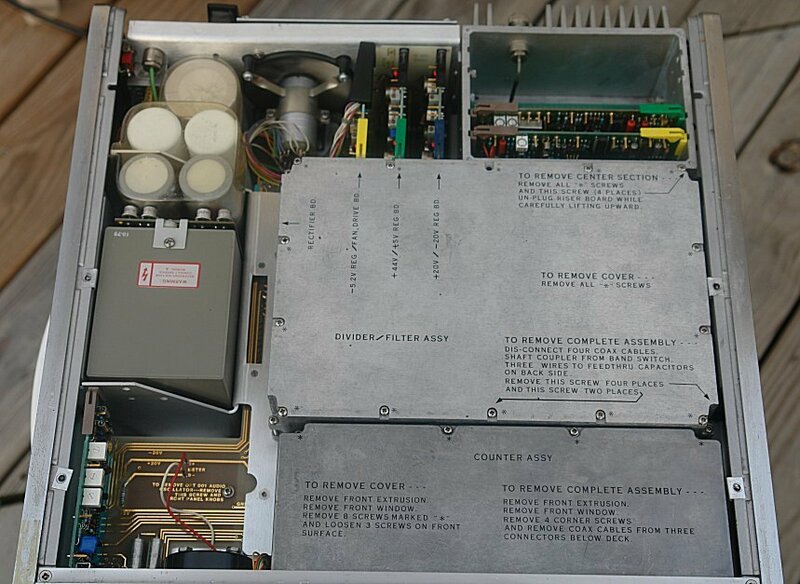 Unfortunately they tended to blow out their output IC's, which are irreplaceable, making the rest of the unit worthless. 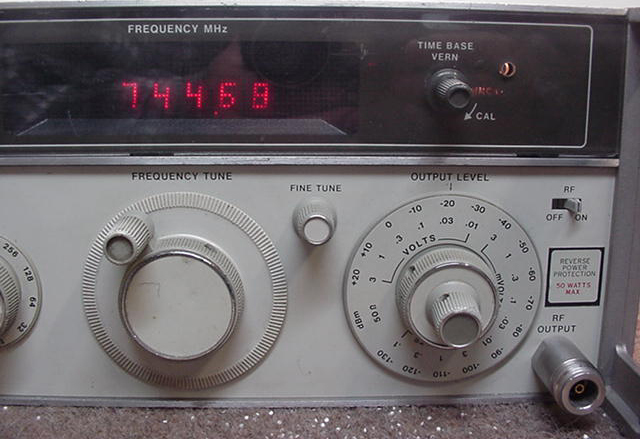 001 : Variable Modulation frequencies from 20 Hz to 600 kHz. 002 : Frequency Doubler - Allows for frequency outputs to over 1 GHz. The 8640B provides AM, FM and pulse modulation for a wide range of applications. AM and FM can be performed independently or simultaneously in either the internal or external modes. Pulse modulation is via external modes only. Other significant features are extremely low noise, built-in phase lock, ability to utilize the frequency counter for external signals (unit doubles as a frequency counter across its full range) and front panel controls for ease of operations. The phase lock feature is very nice in that the operator can set the frequency on the display, push the phase lock button and the unit will lock on to the displayed frequency. The built in frequency counter has a 6-digit LED display and gives a normal resolution of 10 kHz at 500 MHz and 10 Hz at 500 kHz. The resolution can be expanded by using the x10 or x100 buttons near the display. In the x100 expand mode, the resolution is 100 Hz at 500 MHz (1 GHz w/opt 002) and 0.1 Hz at 500 kHz. An “overflow” light will light warning the operator if the scale is expanded beyond that which the unit can measure however the least significant displayed digits are still accurate. Amplitude Modulation (AM) is variable from 0% to 100%. The front panel meter gives a direct readout of AM% in either external or internal modulation modes. Frequency Modulation (FM) is calibrated, metered and constant with the frequency and band selected. There is a wide selectable range of FM; on the 256-512 MHz band the maximum deviation is 2.56 MHz peak or 5.12 MHz peak-to-peak. Pulse modulation is an external input with front panel switch selection. In this mode, pulse inputs and repetition rates to 500 kHz and widths down to 2 microseconds can be applied to modulate the RF carrier. Rise and fall times vary with output frequency down to < 1 microsecond from 8 to 512 MHz.